Last year you got to meet all the candidates. As we move closer to the election this year, the time has come to start the process of narrowing down the field. 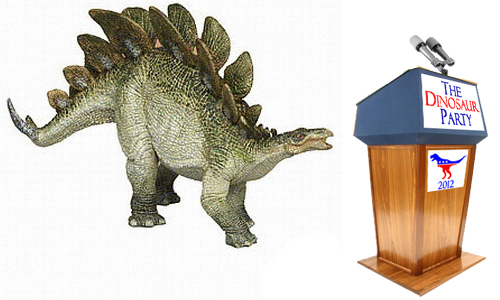 And so, we here at TNR are proud to present the debates that will decide which dinosaurs will be your president and vice president. The format will be simple. If you're unfamiliar with how we run "battles" on the site, we'll start with two candidates, each giving their best effort to be your choice. At the end of the post, you vote on which one will move on to the semi finals. 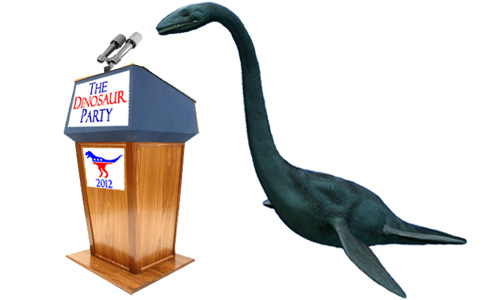 When everything is said and done we'll be left with two candidates, one of which will be The Dinosaur Party's presidential pick. Now, let's throw some dinosaurs in the ring. TNR: Mr. Buster, if elected, how would you approach foreign policy? Phil A. Buster: I'd be firm but fair. I think we can get a real dialog going with countries that we haven't necessarily had the greatest relationship with. It's all about who you know, and brother, I know a lot of dinosaurs in a lot of high places. TNR: Please don't call me brother. Phil A. Buster: Sorry. I guarantee I'd be a lot better than the wading nightmare that is my opponent Mr. Pane. He swims where he wants without regard to who those waters belong to. It's a quick way to start a war. TNR: Time is up, thank you. TNR: Mr. Pane, same question. Cam Pane: First of all, I don't swim wherever I want. Just because I am, by nature, aquatic, doesn't mean that I'm not subject to laws same as any land dweller. However, swimming in international waters has afforded me the unique opportunity to meet many citizens of other countries. I've already got a good relationship with Scotland, thanks in part to my cousin whose family has resided there for years. TNR: The Loch Ness Monster is your cousin? Cam Pane: Loch Ness? Oh, you mean that mythical creature. No, I'm talking about Bubba McClintire. He lives off shore. His great grandfather was responsible for creating golf. Actually because of that, he has several ties to parliament through business partnerships. Phil A. Buster: That'll come in handy if we're ever worried about Scotland nuking us. TNR: Mr. Buster, it is not your turn. Actually, time is up. Thank you both for taking the time. Cam Pane: Thank you Mr. moderator. Phil A. Buster: Vote Phil. So we have come to the end of the first round. Who will you choose to move on to the next round? Voting will close Friday night at 11:59 pm. If you'd like to get reacquainted with the candidates, you can check out Phil A. Buster and Mr. Cam Pane's introductory speeches from last year. Then on Saturday we'll see who moves on to the next round, and whose political career is extinct. Show your support for The Dinosaur Party on Facebook and Twitter. It's close! Not much for mud slinging though. Or dino poop slinging. Guess this round I'll vote for Cam Pane. Think the best it yet to come though! I'm voting Phil. I mean, come on brother, what's not to love about him? I like water and I like scotch. Sometimes together. I gotta go with Phil, I mean anyone using "brother" like the Hulkster has got my vote! I vote for Phil because I would like free transportation. No fossil fuels in the air would be good - only poop on the ground. Phil has my vote...he answered the question although he did sling a low blow Pane's way. Plus I'm with Belle, free public transportation, woo hoo! Well, as long as it's not being carried in a T-Rex's mouth. How cool would it be to have a president named Buster? *Hey Buster! Sup? * Besides, Pane is a name with ridicule built right in. *President Cam is such a Pane. * See? 1 vote for the Steg. I'd totally name my Lock Ness Bubba as well. I wonder what Melvin would think of these Dino-Stars?!!! I vote for phil! TS thanks for the sweet words on my blog!